I love the Smithsonian magazine. Both the print and online versions. The articles are incredibly cool and range all over the place, from why we incorrectly believe that carrots help us see better to what people snacked on during the 1963 March on Washington. During a recent run through their online history articles, I ran across a very cool interactive activity that lets you look at past and present maps of six major US cities. The magazine recently dipped into David Rumsey‘s collection of over 150,000 maps to find some of the best representations of American cities over the past couple hundred years. With some simple programming, they were able to overlay images of vintage maps of some major cities onto satellite images from today. 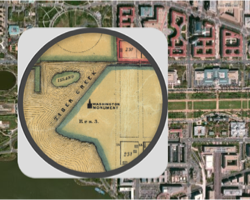 Using Google sat images and 19th century maps, you can zoom in and out of the six places while using a special fun spyglass tool that takes you back a century in time. You start with the present sat view as the main map but a button in the top right hand corner lets you swap out the views. You also get a nice article describing the vintage map and some background info on the specific city you’re looking at. Pretty sweet. And fun. And if you give it enough time, I’m sure you will come up with very cool educational applications for all of them!